Marlyce Stockinger(Dobro), and David Dean White(Dobro) The backup band was Russ Burns on drums, Buddy Lewis on bass and sound tech, Dino Strunk was unable to play due to a previous engagement but Johnny Zazuliak stepped up to the plate and filled in with his accordion……Thanks John! perform was Cathy Smeenk singing "Once A Day" while David White started the round of playing..…fantastic Cathy! Jeremiah next chose to start with ”Amazing Grace”…. such a beautiful rendition Jeremiah…JoAnn’s 2nd choice was a lovely version of “The Waltz You Saved For Me”. Next up Marlyce sang “Sweet Dreams”…fantastic again.!.. Cathy’s next selection was a rousing version of “Y’all Come”….You managed to wake us all up…lol Jeremiah started the group off with “What A Friend We Have In Jesus” and was accompanied by Russ Burns on vocal and John Z on the accordion…It was gorgeous guys!…The last song before snack break was “Crying Time” and was lead by John Z on accordion….  Texas”...splendid John! Next Cathy sang “Me & Bobby McGee” while David started the round…Jeremiah chose to change the pace with “Milk Cow Blues” while Buddy joined in and sang 2 verses…JoAnn kept the pace with "St Louis Blues”…fantastic Jeremiah and JoAnn. Mike Squires started the next round with “Cold, Cold Heart”…while Steve Melchi chose a fabulous swing tune Buddy took the floor and sang “Send Me The Pillow” and Charlie Steichen sang “Make The World Go Away” followed by Russ Burns singing “Please Release Me”…outstanding guys! Cathy then chose “I Still Miss Someone” to sing on David’s round. Jeremiah then started off his round with "Together Again” while JoAnn chose the “Steel Guitar Rag” for her last round and Mike Squires picked “ Faded Love”….Buddy again stepped up to the mic with “I’m Crying My Heart Out Over You” while Marlyce sang harmony….Marlyce closed out the day with a beautiful version of “Amazing Grace” asking the crowd to join in on the last chorus!!!! Well folks the Super Event was a great success!. 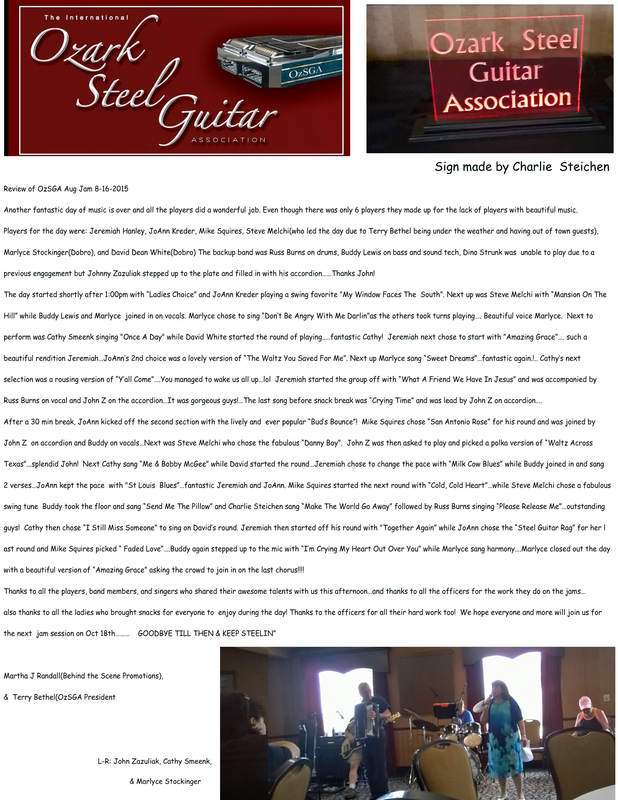 All the players played their hearts out this years as usual….Thanks to everyone who played steel, the staff band, all the workers and vendors and guest artists…you all are important to the success of the show. Thanks to all those who came to hear the music for without you we wouldn’t have a show!…Larry Garrett got us off to a marvelous start this year, followed by the always lovely Janet Wise a favorite Houston, TX performer, then Clovis Richards an Oklahoma favorite, Hayden Bramlett played fiddle for Larry Garrett & Clovis Richards as well as Patsy Cox sang on Clovis’ set, next the lovely Linda Wright & her husband Richard on trumpet, followed by the terrific Ron & Opal Erickson, and Jerry & Donna Newberry who are favorites of the events…the morning was ended by Rick Crow and Wayne Morton who pleased the crowd as always with their twin steels..
After Lunch our illustrious President Terry Bethel started off the afternoon with a wonderful set and was joined by Richard Wright on trumpet,….He was followed by the great Johnny and Joan Cox. 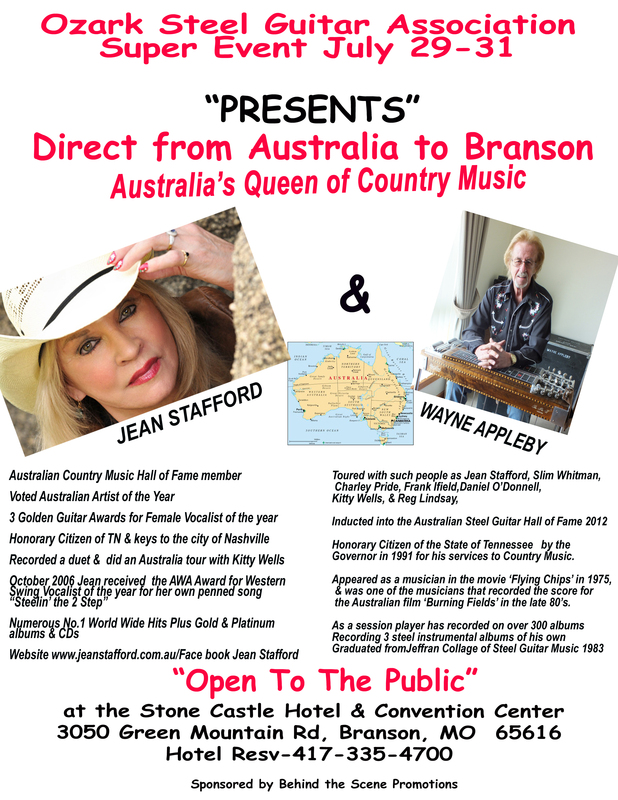 Johnny is now playing for Mel Tillis as well as the Baldknobbers and Joan is a sought after performer in TX. We hope you can both join us again next year. Next up was Wayne Link and his daughter Wanda Wall from Canada whom we also hope will join us again Then the incomparable Joe Wright who is always loved at the OzSGA Super Events. He is not only an awesome player, but sings great and amuses us all with his comedy. We hope Joe will be a mainstay for many years to come…next up was Bob Tuttle, and Louie Halford both are fabulous players...The day finished with Russ Weaver who relinquished his band duties as bass player to show us he was as at home on the Steel as he is on bass….The night closed with a great Beginner/ Intermediate Seminar hosted by Steve Palousek and Terry Bethel..Very informative evening even though I can’t play…. Saturday’s starter was the fabulous JoAnn Kreder, Welcome to our family JoAnn and hope you’ll come back! 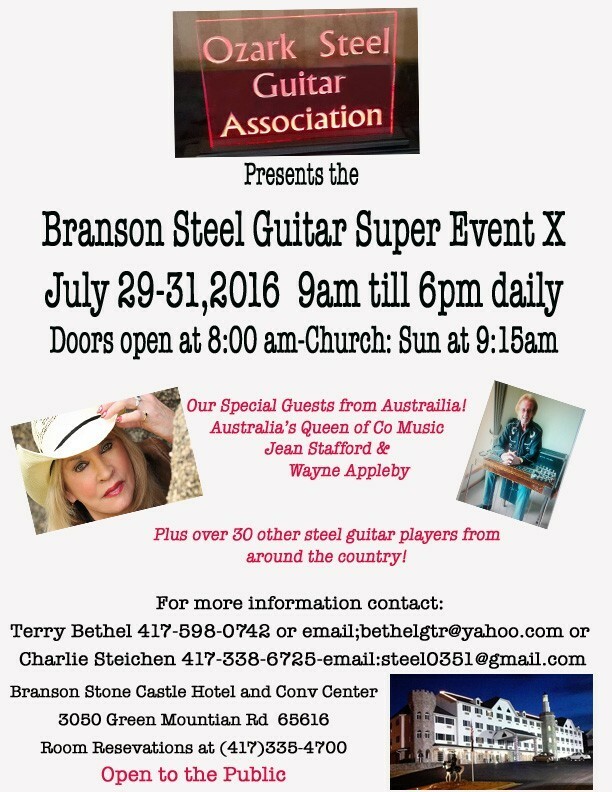 I understand that JoAnn & Joan Cox played together as kids while their fathers played steel together. While at the jam they discovered they were the 2 girls playing together and had both taken up steel guitar They had not seen each other since they were "those" kids and now both play steel guitar and both are exceptional players! 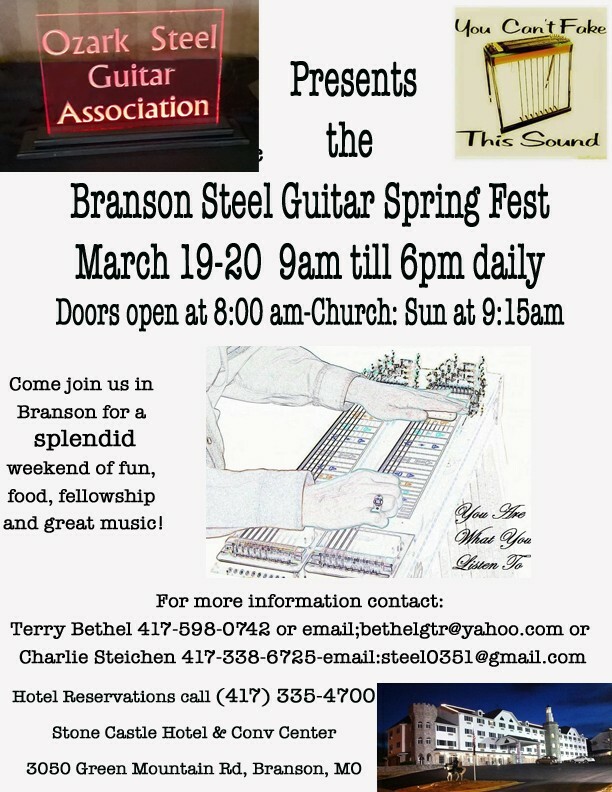 (Robbie plays steel for Billy Dean over at the beautiful Starlight Theater in Branson You should go see the show if you get the chance…I loved it) and Gary Ash a fabulous singer who said if he had known he had to follow Billy Dean he would have said no….Ha....Next was the always loveable Eddie Lane then Dean Holman who also played Dobro for us, Dean is a regular with the Presleys’ playing Steel, Dobro and whatever else he can... The morning ended with Keith Hilton joined by two of his local band members playing along…Keith is the man behind Hilton Volume Pedal used by many of our players..Frank Warmbrodt sang on several different sets..
After a short lunch break, the afternoon was started by two greats, Mike Beasley, then the well loved favorite Joe Wright. Next up was Gene & Gayla Crane who are always favorites of the OzSGA crowds., then Steve & Donna Palousek, Steve is one of Terry Bethel’s all-time favorite players and Miss Donna sings like a bird!, Then Janet Wise joined us again for another beautiful set followed by another splendid player, Larry Baker & the beautiful voice of his wife, Jean Devore(Jean often sings with other players as well). Next up was the fantastic Mike McGee(another of Terry’s all-time favorite players), this time Mike was accompanied on vocals by not only Max King but also Joe Wright . Then Terry Wood was joined by his boss the marvelous Walenia. Closing out the day was Steve Melchi(who plays steel for Jeanie Kendall). Steve was also the host for the annual Sat night Jam Session which was a great success. This year saw 10 pickers joining in to provide a great night of musical pleasure for those of us in the crowd. Sunday morning was started off with a wonderful church service by Jeremiah and Venda Hanley. With Jeremiah’s wide vocal range and the sweet melodic tones of Ms Venda, along with Jeremiah on steel & Venda on piano the crowd was well off to a great Sunday start. The Hanley’s have been holding Sunday Services for the Events for many years and we hope they will continue the tradition for many more! Again Steve and Donna Palouse pleased us with there talents followed by Keith Hilton and his local band members. Then Michael Todd Hermsmeyer and Stephanie Hall pleased the audience immensely, Michael Todd plays for Mickey Gilley…after Mike, Terry Bethel took the stage again and had some assistance from Jimmy and Starla Queen Jimmy played drums for the ISGC for years and Miss Starla can sing a rousing Western Swing song with the best of them hope they’ll join us again…next was Terry’s hero, Mike McGee again and the amazing Joe Wright closed out the show with an awesome set…Thanks to everyone for playing and singing your hearts out. Sorry if I missed any singers or players who made guest appearances on the show…..Looking forward to an even bigger show in 2016…..Keep on Steelin’…:)………. 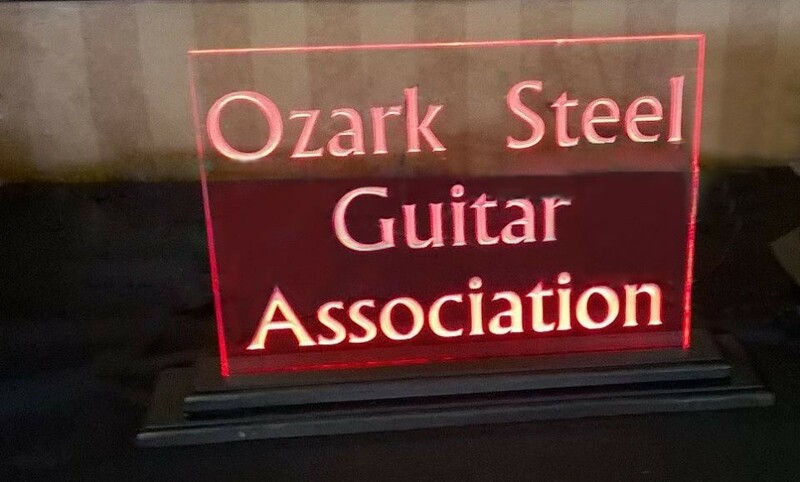 Members, family, and friends of OzSGA gathered at the Stone Castle Hotel at 1pm to celebrate the season and usher out the 2015 meetings with lots of Fun, Food and Fellowship along with great music! Each player was asked to play 1 or 2 songs and afterwards everyone joined in for a marvelous jam session. We had 18 players join us (Marty Neer, Clovis Richards, Jeremiah Hanley, David Dean White, Bob Tuttle,Jerry Smythe, Larry Gerdeman, Keith Hilton, Ted Emmons, Bob Harris, Jerry Newberry, Jack Musgrave, Eddie Lane, Terry Bethel, Stven Melchi, JoAnn Kreder, Mike Squires, and Ron Ericsson) along with our faithful band members (Dino Strunk, Russ Burns, and Buddy Lewis) and singers(Ted Emmons, Charlie Steichen, Eddie Lane, Cathy Smeenk, Larry Gerdeman)...the ladies again provided us with an outstanding array of food. Many attending were festively dressed in fun holiday fashions....:) The main room was full of guests....about 72 to 75 were present. Charlie welcomed everyone then we had the Pledge of Allegience....Jeremiah & Venda began with a group sing of "Jingle Bells" and "Silent Night'….then Eddie Lane started the music with "Let it Snow" and Bob Tuttle blessed us with "White Christmas".....Jerry Smythe played a beautiful rendition of "What Child Is This? "...next Ted Emmons...played "Silent Night” on the steel and dobro…..Jack Musgrave then played "It Came Upon a Midnight Clear"….followed byDavid Dean White play[ng while Cathy Smeenk sang "Silver Bells"....We then had break time and everyone filled up on all the great food and desserts and had lots of fellowship. ​He stole the show!​.... Ron was followed by Larry Gerdeman .with Johnny Cox on bass. Then Jerry Newberry played a beautiful set with Austin on bass, followed by , Austin Stewart and as always they were both crowd pleasers...closing out the first day was the super smooth playing of Terry Wood. After a break Mike McGee hosted a great seminar which was attended by ​several​ players. Sunday started off with a beautiful Church Service from 9;15-10:00 AM hosted by Jeremiah & Venda Hanley First to the stage was Jerry Smythe who did a fabulous set! Next up​ was the super Dean Holman, who also played the Dobro. Dino sang a couple songs on his set Dean is doing a fabulous job over at the Presley's theater. Dean was followed by Austin Stewart who filled in for Terry Bethel who wasn’t feeling well..Fantastic picker and a splendid young man! Next was the incomparable Johnny Cox...with Dean Holman on Dobro. And Country Jack Harper sang Don’t You Ever Get Tired Of Hurting Me?....good to have Johnny on the show. He currently plays for the Baldknobber's show..rounding out the morning session was Larry Garrett. Great job Larry! After the last player everyone(12 players David Dean Wright, Jeremiah Hanley, Dean Holman, Austin Stewart, Jerry Newberry, Larry Garrett, Jerry Smythe, Eddie Lane, Jack Musgrave, Mike Mc Gee, Steve Melchi, JoAnn, Kreder and the band, Dino Strunk on Lead, Mike Jackson on drums, Buddy Lewis on Bass & Eddie Asher sang while young Jacob King watched.. Thanks to all the players who joined us for a great weekend. Thank you to Terry and Charlie for all their great work. Thanks to all the ladies who provided us with all the yummy snacks. A big thank you to the Stone Castle Hotel for working with us to provide a beautiful place for our shows and jam sessions.